The local northern hunting experience that comes once a year is upon us once again. 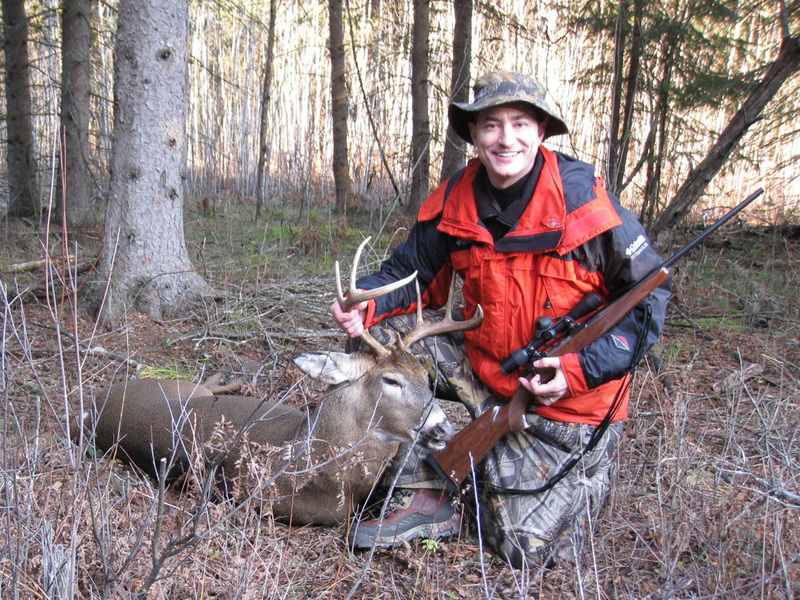 On a large portion of acreage in northern Michigan, Deer Camp is set up with a main lodge and hunters choice from fourteen different deer blinds strategically placed throughout the landscape. Each hunter has their own special preference as to which deer blind they choose to hunt from. 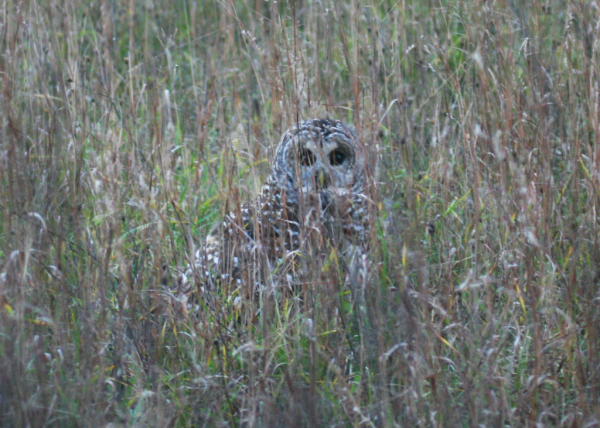 These typically don’t vary from year to year, but occasionally hunters trade spots, or give up their blind after they have had a successful hunt. Weather is always a factor in the hunt; too warm and the deer don’t move as much as they do when it’s cold and a slight covering of snow always helps too. The weather for this year was picture perfect, cool fall weather with all day sunshine and clear, starry nights. 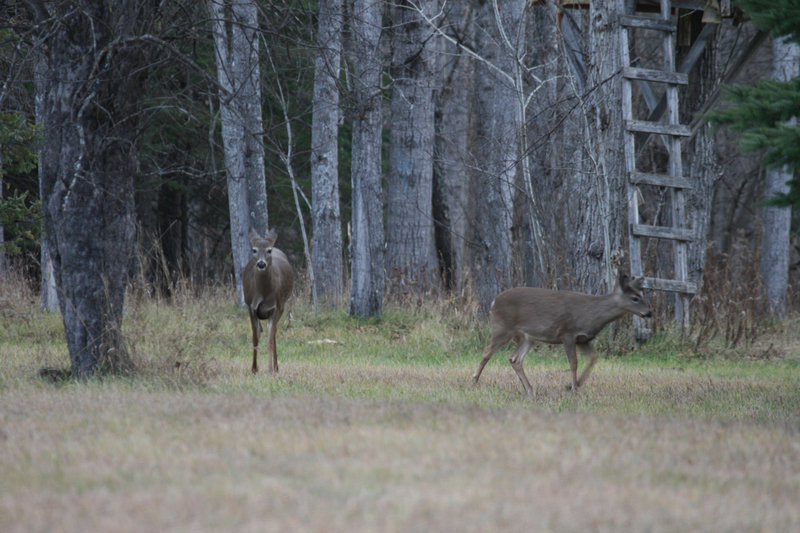 I can’t remember a more pleasant stretch of fall days for deer camp in recent years. A few years ago It was too warm, reaching a high of 55 degrees in the afternoon, and then there was that one year when the early morning temperature dipped down to -9 below. Each of these weather patterns brought their own set of issues that contributed to the hunting success ( or lack thereof) for that year. This year it was nice to spend time in the woods and forest for a few days and the terrific weather that made the experience all the more enjoyable. My opening morning started off just like any other year. A good cup of coffee and a full thermos to take with, along with a sandwich and some cookies to help keep the munchies away. I dress in several layers of clothes to keep warm in the blind along with aim insulated set of camo overalls just for deer hunting. I think of these as a wearable sleeping bag because they area quite warm and insulative against the cold. I took out my rifle and checked the magazine for enough rounds. I walked the long meadow from the lodge down to my blind which has a splendid view with a nice viewing area known affectionately as “Death Valley”. Deer regularly visit this grassy meadow browsing on the sweet rye shoots. Once I arrived at my small northern woodland condo, I unpacked my gear and settled in to watch the morning unfold as the sun rose in the east and splashed the valley with sunlight. The experience of watching the forest come alive in the morning is one of the many pleasures that deer camp holds for me. I had a few four legged visitors close to the blind, but nothing to put the scope on. 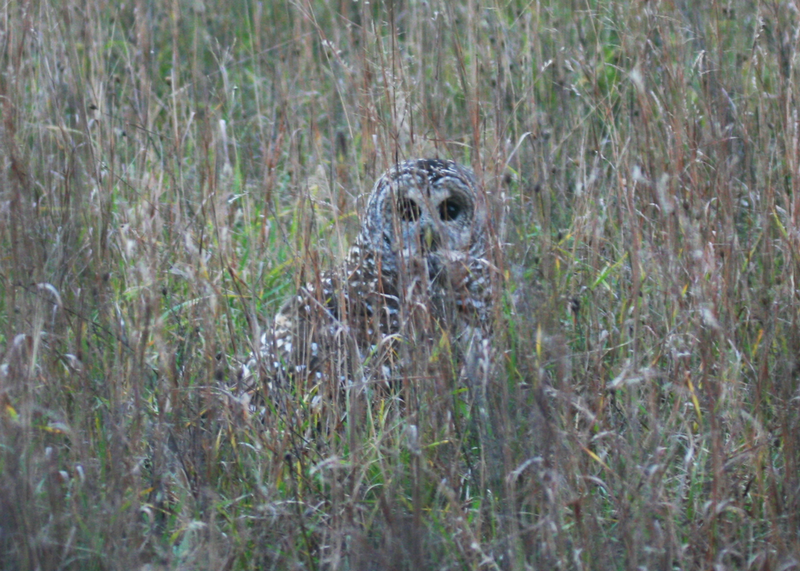 About 9:15 am in the morning I was enjoying my second cup of coffee and I noticed some movement out of my right window. A large deer was walking to the right of my blind and stopped, just out of sight behind a small group of trees. I opened the window and aimed my rifle out the window. I had to wait a few seconds for the buck to clear the trees to get a good look at him. I lined up the shot and pulled the trigger. The large 9 point buck lay on the ground a few minutes later. This would be the first deer on the buck pole this year. The remainder of deer camp was very relaxing with card games, camaraderie, and some great meals. Cedar enjoyed her time out in the weathering yard as she came along for the trip. My fellow hunting crew really enjoyed having Cedar perched in the yard as well. Cedar also took to tolerating Wink pretty well, as he wandered around camp enjoying all the smells. Wink is an eight year old English Setter who really likes hunting grouse and woodcock in the fall. 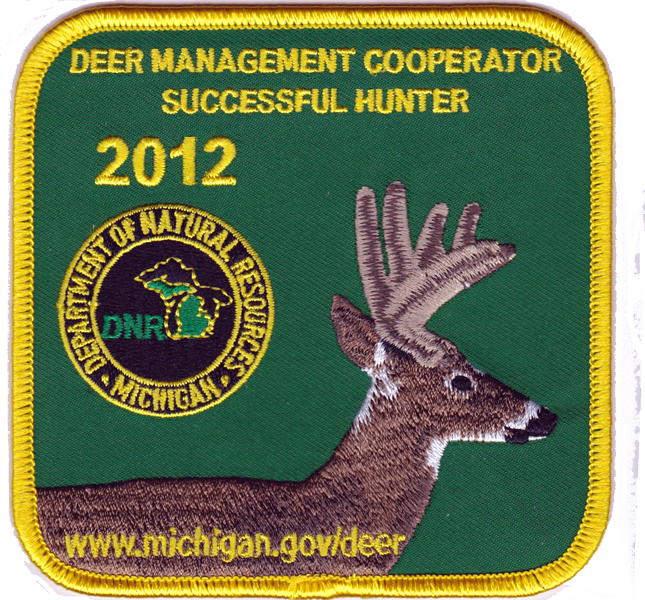 Here’s the nice patch I received from the Michigan DNR when I stopped at the Deer Check Station in Mio. Deer camp is a wonderful time of year. Time to spend out in the woods in pursuit of a large prize that the woods may grant to a lucky hunter. 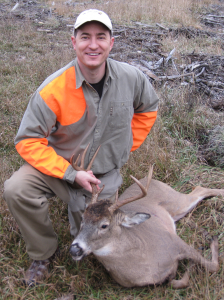 I was such a lucky hunter this year, downing a hefty 9-point buck at 8:45 am. He was first one on the buck pole. What a great way to start deer camp. Another adventure at deer camp comes to an end with no buck to show for the time and effort in the deer blind this year. Hunting deer is quite honestly a lot of luck and being in the right place at the right time. On Sunday morning, opening day, I packed up my gear and walked the awesome walk in Death Valley to the deer blind at about 6:15 AM. It was a relatively warm morning (42° F) and the stars were clear and plentiful. Seeing all the stars in the morning is quite possibly my favorite thing about walking out to the deer blind in the dark. I love it! Once I arrive out at the hunting hide, I unpack some of my gear, turn my flashlight off and enjoy the dark and quiet for a few moments before daylight breaks and lights up the sky. The air is clean and the windows are dusty and covered in spider webs. I’ll clean those off a little later when I can see with more sunlight. The deer in the area are moving around slowly, and it wasn’t until about 8:00 AM that the first sign of deer in the valley were seen wandering to the south. Three does walked around for about 20 minutes and then decided to take the South Trail out of the valley. It wasn’t until much later in the day that they came back out to take another look under the apple tree for more tasty morsels. 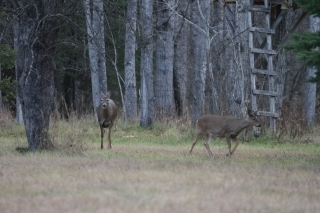 I can’t remember a nicer opening day at deer camp. 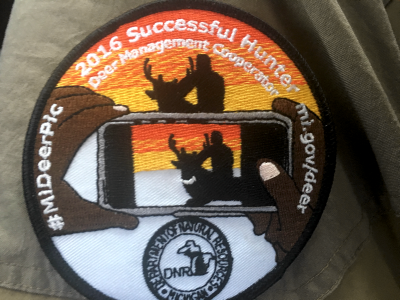 The best joke of the weekend was that you could sit in the Deer Blind with khaki shorts, a hawaiian t-shirt, and drink margaritas while deer hunting this year. At the end of the day, no bucks were seen in Death Valley and my day ended without taking a shot. Despite the lack of targets to line up the cross-hairs on, I still enjoyed my comfy spot in the woods that allowed me to watch the sunrise, the sunset, and all that happened in between. It was not a wasted day at all! Monday morning came early and it was much colder than the previous morning (25°F). Another hike out to the deer blind reveals more stars with the flashlight OFF and the grass is a little more crunchy today. Ah, well, that’s the way it goes sometimes. My feet ended up getting a little cold, but I was able to warm them up and make it through the morning. The valley opens up a little early today, with a singleton Doe walking out of the aspen with a layer of frost on her coat. It appears that she just got up out of the grass where the frost collected on her fur. A few minutes later, a small spike buck appears on the scene, and wanders down Death Valley too. He is a nice looking deer, but certainly not large, let along have the horns to be a viable target for the buck-pole. As the 10:00am hour arrives, I notice that I’m not going to be successful much longer as Tahoe is going to need some water and a hunt today. As I pack up my gear, I wish I could enjoy another day in the blind but the lure of hawking calls and I am off for another hunt. 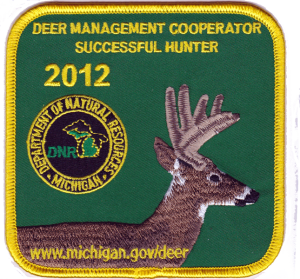 Another deer season ends unsuccessfully, but it is very enjoyable with the Uncles and Cousins that also come each year. The big buck will have to wait until another time. 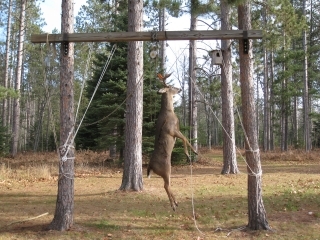 The buck pole was not empty, however. 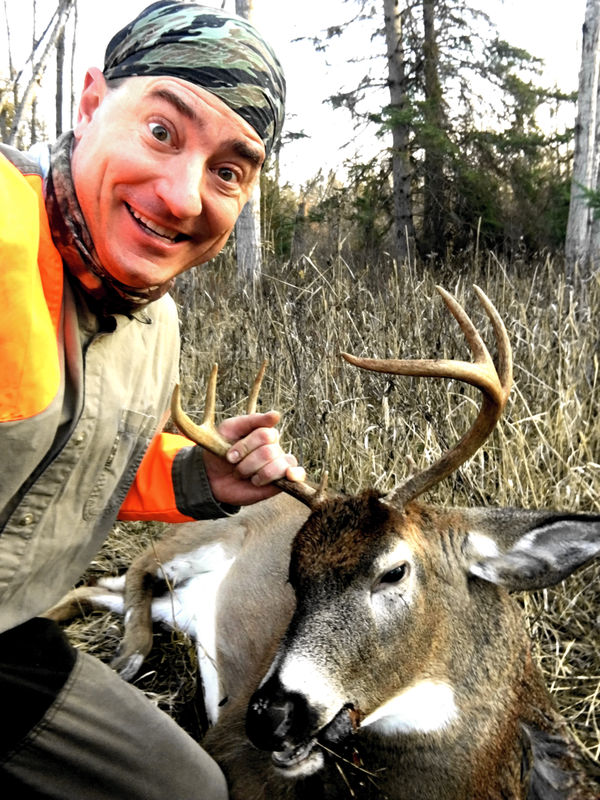 My Cousin nailed this 9-point buck early on opening day! Opening day was a success for one hunter at deer camp and I await the final tally from the entire crew at the end of the week.